Some Helpful Tips to Enjoy Cosmos Meats to the Fullest! Always take your meat out half an hour before serving it for the best flavour! Make sure to use a sharp knife to cut the meat. It will make for easier and thinner slicing and better presentation. The best way to keep your meat fresher for longer is to put into a paper bag after each use. And remember to ALWAYS refrigerate after opening. Creating a cheese and charcuterie board is quick and easy to do. It's perfect to share with guests or simply to enjoy alone or with family. 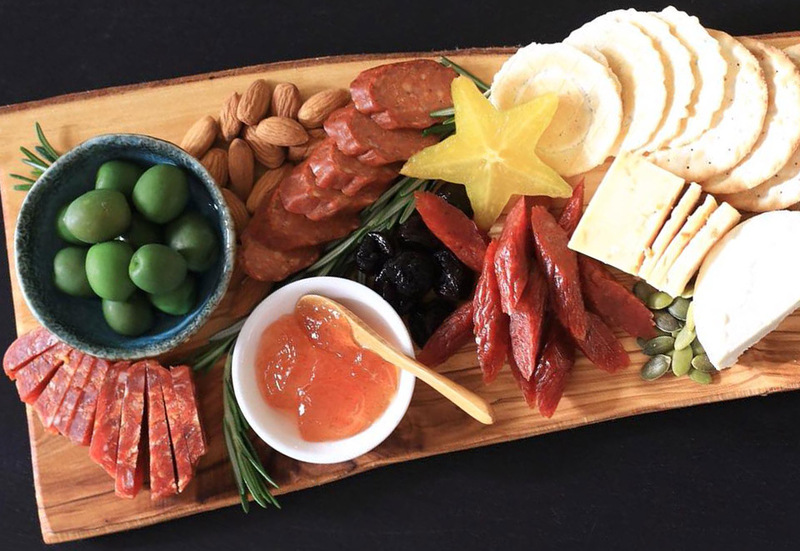 A Selection of Cosmos Smoked Meats - we recommend: Salami, Portugese Style Chorizo, Soppressata, Prosciutto.. but you can use any of your favourites! 2-4 ounces per person should be sufficient. Accompaniments - we suggest: pairing the Cheese with sweet things like Grapes, Honey and Jam while the Smoked Meats are great with briny things like Olives, Pickles, Marinated Artichokes, Pickled Onions or Pickled Asparagus. Other great options include Nuts, Fresh Figs, Cherry Tomatoes, Slices of Pear, Apple or Melon. Now arrange it all pleasingly on a big wooden board, then sit back and enjoy the explosion of taste!